MacBook Air Hinge Defects: Warranty Covered? Now everybody knows that nothing in this world is perfect, but when you buy a computer, and pay good money for on, then you excpect it to be pretty close. You also expect for its little imperfections to at least be covered by a humble warranty. The MacBook Air is no stranger to problems. Upon its realease, the MacBook Air was experiencing overheating problems which was not covered under the warranty. But now, the MacBook has an all new problem, one that is causing alot of people some severe frustration. 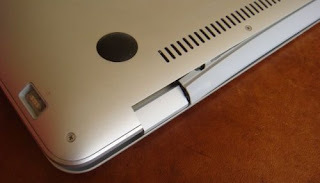 On each and every laptop there is a thing called a hinge. The hinge is the main piece of equipment that allows you to raise and lower your screen and holds the screen in place when you adjust it to where you want it. Now, if this hinge becomes damaged, our screen won’t stay in place, rendering your computer basically useless to you considering it we don’t have enough arms to type, use the mouse, and hold up a screen at the same time. Reports have confirmed that with first-generation MacBook Airs, the hinges become loose over time and eventually catch and crack under normal use, meaning there was no repressed rage forcing the omputer screen around. Now while this is a mojor problem, you would think that Apple would have your back and help you out by covering this with its warranty. Nope! While looking at Apple reports about this problem, Apple claimed the broken hinge as an “accidental” occurence and would not support it under its warranty. If you call Apple and report this you will find out that Apple will fix it for you…….at a cost of around $800 – $900! For that much you’re better off buying a new laptop. Apple is refusing to accept this as a manufacturing error and insists that the damages are caused by the individual owner. Needless to say if problems keep arising with the MacBook Air, Apple could suffer in profits. Check out these videos to see exactly what I’m talking about.